In August, Floyd Mayweather and Conor McGregor will enter the ring for what will surely be the most-watched fight of the boxing year. Fans might listen to these comments from McGregor’s camp and get excited at the prospects of a potential upset. Mayweather is 40, Conor is in great shape and will likely throw one of the hardest punches Floyd has ever been in the ring with. “All McGregor has to do is land one good shot,” some might think to themselves. Unfortunately for these hopes, both fighters have released videos showing themselves training for the upcoming bout, and viewing them next to each other, it’s hard to think McGregor will exit the ring a winner. First, Mayweather posted this video to Instagram. The speed and precision Floyd shows off here is unmatched, and the reason the fighter is still undefeated after 49 career fights. The way he stays in time with the bag is impressive. He is a part of it, and knows exactly where both his body and his target is at any moment of the interaction. Compare that to this video, which Conor McGregor posted on Twitter. Here, McGregor looks surprisingly human. He’s still cut like he was sculpted out of tattooed marble, and the punches he’s throwing there are still ten times more powerful than most, but at no point during that clip does McGregor strike you as exceptionally fast, despite the tag of MCGREGORFAST.COM at the end. Compared to Mayweather, McGregor looks as if he’s moving in slow motion. While it’s possible Conor’s video is some complex piece of psychological warfare meant to make Floyd think something about his opponent that’s ultimately untrue, against a boxer of Mayweather’s calibre, the mental games are unlikely to matter much. 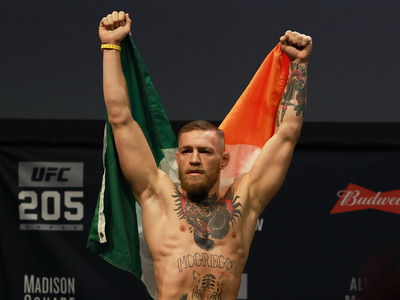 Vegas doesn’t seem to like McGregor’s chances in the fight much either — the Irishman is currently listed between +650 and +700, meaning that a $US100 bet would win $US650 or $US700 with a McGregor victory depending on where bettors caught the number. While that’s good money for McGregor believers, those odds indicate that the sports books don’t think McGregor’s chance of success is all that high. If you go to MCGREGORFAST.COM, you’ll find a page advertising McGregor’s conditioning program that claims it can “change your life forever” in just 12 weeks. Unfortunately for McGregor, his fight is just nine weeks away.